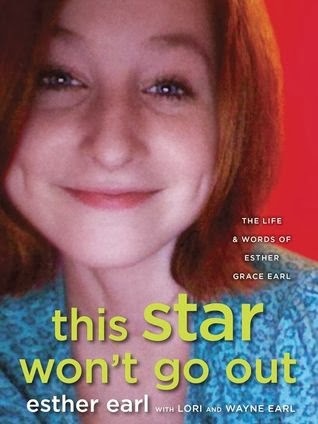 I am reposting my review from January of 2012 because today, January 28, 2014, marks the publication of This Star Won't Go Out by Esther Earl, Lori Earl and Wayne Earl. For those of you who don't know, The Fault in Our Stars is dedicated to Esther Grace Earl, who died of thyroid cancer in 2010 at the age of 16. Please scroll to the bottom to read about this remarkable young woman and the journals, fiction, letters, sketches and family photographs as well as essays and commentary from friends, a journal of her illness kept by her parents and an introduction by John Green that make up this amazing book. I don't want to say that "The Fault in Our Stars" is the most romance I've had in my life in many months, but it's true. John Green is the master of teen romance novels, knowing exactly where, when, and how to tug heartstrings. It is guaranteed that all female teen readers will fall for Augustus, and while I can't assume anything about the male teen readers I'd go as far as to say that Hazel has a personality that any guy would be lucky to find in a potential wife/girlfriend/best friend. Us teenagers tend to... I don't want to be too general or too harsh here, but we tend to over-exaggerate things that are actually insignificant, especially when it comes to relationships. Green knows this, but also knows how to save Hazel from the plight of the angsty, whiny, helpless protagonist too often seen recently (cough Bella Swan cough). Hazel and Augustus instantly develop the kind of bond that I associate only with 20+ years of marriage, hence avoiding the inevitably awkward beginning-of-relationship phase and jumping right into the good stuff. I guarantee you will be crying by the time you finish this book, not just because of the plot but because of the perfection that seeps from every word. In a sense, you could say that John Green's writing is a little formulaic. The thing is, this formula is like sugar (in the best way possible) and once you taste it you want more. This is not to say that his books are the same thing over and over or empty literary calories, but you can always count on Green for thoughtful, witty, verbally astute characters who are outsiders of one sort or another and capable of ideas and actions that are both empathetic and philosophical. The Fault in Our Stars is narrated by Hazel, a sixteen year old with thyroid cancer that has spread to her lungs and weakened them, making an oxygen tank her constant companion. Green is a master at getting inside his character's heads, male or female. Hazel has been sick for three years and had one hospitalization she almost didn't survive. Cancer and illness are an every day, every minute, part of her life and she is weary from but accepting of the way it has circumscribed her world. Above all else, she seems to be remarkably sensitive to how her cancer has affected her parents' lives, especially after overhearing her mother, when she thought Hazel was going to die, grieve the fact that she "wasn't going to be a mother any more." Hazel's mom has made her cancer and keeping her alive her job and Hazel is sensitive and respectful of this, trying to give her parents as much time with her as possible. This is probably why, when her mother fears she is depressed, she grudgingly agrees to go back to attending the cancer support group for teens and this is where she meets the handsome and charming Augustus Waters who seems to be unable to take his eyes off her. Augustus tells the group that he is seventeen and "had a touch of osteosarcoma a year and a half ago, but I'm just hear today at Isaac's request." Isaac is about to loose his other eye to cancer. When the group leader asks Gus how is he feeling he replies, "Oh, I'm grand. I'm on a roller coaster that only goes up, my friend." Gus, once a high school basketball star, has lost part of his leg to the cancer but seems to have a remarkably optimistic attitude. When asked to share his fears with the group, Gus says he fears oblivion. In an uncharacteristic move for her, Hazel raises her hand and repeats a quote from her favorite book, An Imperial Affliction by Peter Van Houten about the inevitability of oblivion. Augustus' fear of oblivion, of leaving this world without leaving a mark on it, Hazel's obsession with the novel and the relationship that the two embark upon make up the backbone of The Fault in Our Stars. Cancer is always present, from the medical treatments the characters undergo to the "Cancer Perks" (their words) they receive to the unexpected hospital stays. What makes this book readable and worth reading is the humor and contemplative nature of his characters. Gus, besides unleashing no end of blind man jokes on Isaac, chides Hazel for using her wish from the Genie Foundation on a trip to Disney World. The two make constant jokes about cancer, missing limbs, first person shooter games and Gus's bad driving. But, they also share moving insights and lyrical observations that make you stop and think. Even though they know they are dying and may not live to adulthood, Hazel and Augustus know how to recognize and enjoy what is beautiful and important in life and, and I know this sounds goofy, each other. During her first date with Augustus as he is telling her his history with cancer, Hazel looks at him and thinks, "I really, really, really liked him. I liked the way his story ended with someone else. I liked his voice. I like that he took existentially fraught free throws. I liked that he was a tenured professor in the Department of Slightly Crooked Smiles with a dual appointment in the Department of Having a Voice That Made my Skin Feel More Like Skin." In a passage that shows that Green is still very much in touch with his inner teen (and, if you know anything about him you know that he is very much in touch with his frequently fervent teen fans) Hazel says, "My favorite book, by a wide margin, was An Imperial Affliction, but I didn't like to tell people about it. Sometimes, you read a book and it fills you with this weird evangelical zeal, and you become convinced that the shattered world will never be put back together unless and until all living humans read the book. And then there are books like An Imperial Affliction, which you can't tell people about, books so special and rare and yours that advertising your affection feels like a betrayal." The narrator of Hazel's favorite book, Anna, is a teenager and cancer patient who dies, the author ending the book mid-sentence, mid-narrative, mid-story. Of Van Houten Hazel say he was "the only person I'd ever come across who seemed to (a) understand what it's like to be dying, and (b) not have died." Knowing what happens after Anna's story ends, what happens to her mother, her mother's possibly crooked boyfriend and her pet hamster, becomes a driving force for Gus and Hazel. This makes sense and is another sign of Green's subtle genius and beauty. Getting the end of Anna's story is much easier, emotionally if not literally, than finding out the end of their own stories. I want to leave you with a few of my favorite passages from The Fault in Our Stars, writing that made it possible for me to keep reading this heartbreaking book. This is an old argument in the field of Thinking About Suffering, and its stupidity and lack of sophistication could be plumbed for centuries, but suffice it to say that the existence of broccoli does not in any way affect the taste of chocolate. I was thinking about the word handle, and all the unholdable things that get handled. In what strikes me as one of the most beautiful lines in the book, Hazel notes that, as Gus reads to her from An Imperial Affliction, she "fell in love the way you fall asleep: slowly, and then all at once." That's what I believe. I believe the universe wants to be noticed. I think the universe is improbably biased toward consciousness, that it rewards intelligence in part because the universe enjoys its elegance being observed. And who am I, living in the middle of history, to tell the universe that it - or my observation of it - is temporary? 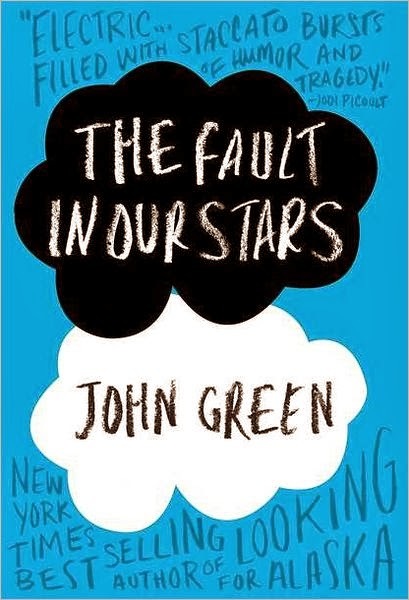 For an enlightening, if staid, interview with John Green about The Fault in Our Stars, visit Weekend Edition Saturday. For a review of Green's book Paper Towns, click the title. Although I haven't reviewed it her yet, my favorite John Green book is one he authored with the amazing David Levithan, Will Grayson, Will Grayson. The Catitude and Nerdfighters don't need me to tell them about This Star Won't Go Out, but maybe there are a few parents and teachers and other bookivores who are not on tumblr and will gain something from the information I have cobbled together here. Sally Lodge wrote a comprehensive article in Publishers Weekly last year talking about Esther, John Green and the way that This Star Won't Go Out came to be. There is also a really wonderful booktrailer that is very informative, moving and inspirational, below. And, if you can still see the screen through your tears, watch John Green's tribute to her titled, Rest in Awesome, Esther, which will also give you a glimpse into how incredible this person was and what she inspired in everyone she came into contact with. Then, click the link under the banner that will take you to This Star Won't Go Out Foundation, a non-profit organization dedicated to serving families with children diagnosed with life-threatening cancer. In 2011, TSWGO gave out 75 gifts totaling $125,000 to help families suffering from the hardships of childhood cancer. The fundraisers that were organized all over the world are incredibly creative and reflect the spirit of Esther. WOW! Thanks! Really! I love to help parents & kids find good books, but when I sit down to write a review I usually get so caught up in the book that I ramble on forever and assume most people stop reading after the second paragraph. Glad to know you value it! Thanks for your kind words and are you a relative of mine?? ?